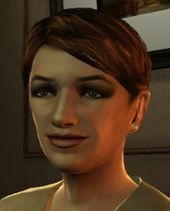 Katie "Kate" McReary (Irish: Cáit Nic Ruairi) is a 28 year old character in the HD Universe and one of the love interests of Grand Theft Auto IV protagonist Niko Bellic. She is the sister of Patrick, Francis, Gerald and Derrick McReary, and the daughter and youngest child of Maureen and an unnamed father. She works at the community center in Dukes. At first, Packie tells Niko to stay away from her, but later encourages Niko to go out with Kate. She holds traditional values, and according to Patrick, "she won't put out". Despite this, the player is still given the option to try and join Kate inside. According to Patrick, Kate witnessed several bloody fights between her brothers; seeing Gerry beating Francis was a traumatic childhood experience for her (she was in therapy for quite a while). Over time she has apparently become accustomed to living close to violent crime, liking Niko despite disapproving of his lifestyle. In extreme contrast to all his sons, Mr. McReary had an excellent relationship with Kate and was pretty much never angry at her. 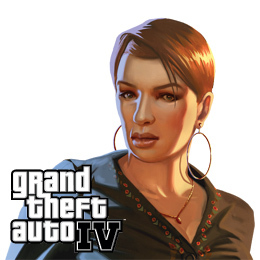 She plays a pivotal role at the end of GTA IV's story. Kate is a bit more complicated to date than the other girlfriends. She prefers Niko to wear clothing from Modo. Her activities are also limited as well, seeing as how she does not like to go bowling, or see a show at both Perestroika and Split Sides. As stated before, no matter how many times you try to "try your luck" at the end of a date, the player will never be invited inside because she only considers Niko to be a friend. Kate's conversations with Niko, after getting her drunk, will eventually reveal that she knew that her father was molesting her brothers. She doesn't explicitly state the her father was a child molester but she does cry that she knew what he was doing to her brothers. One may deduce at first that she knew their father was beating the boys however once Packie reveals that their father molested both him and Gerry one can conclude she knew her father was molesting her brothers but kept quiet since her father did not molest her. She thinks her brothers' bad and illegal behaviors are a means to rebel against their father. The 69th Street Diner or any other diner. Kate's ultimate fate depends on Niko's decision to either do the deal or exact revenge, however only one ending is canon to the series. If the "Deal" option is chosen, Kate berates Niko for doing the deal, and does not attend the wedding. After Niko kills Dimitri to avenge Roman, Kate calls him, telling him that she heard of his cousin's death, and will be there for him. Despite this, she can no longer be dated and does not answer her phone if the player tries to call her. If "Revenge" is chosen she is killed by Jimmy Pegorino at Roman's wedding. Later after Niko has killed Pegorino Roman says that he and Mallorie are expecting a baby, and if it's a girl she will be named after Kate. This ending is canon, as evidenced by Roman Bellic still being alive in 2013. Concept art for Kate McReary. Unlike her brothers, Kate has never committed a crime or misdemeanor. This idea is reinforced through the main missions and dating side missions dialogue, as well as not having a record in the LCPD Database. Despite this, she can help Niko stealing a car while dating by throwing the person who is in the car out of the car. Kate's favorite radio station is The Vibe 98.8. During Mr. and Mrs. Bellic (Revenge) is the only time Kate will respond positively to clothing from Perseus. If the revenge ending is chosen, she may still contact the player due to a glitch. She shows up as an unknown caller and cannot be called back. Regardless of the choice, canonically Kate is still killed, as Roman Bellic is still alive in 2013. This is known because Roman has a Lifeinvader profile, and is shown to be listed as a friend and family member on Niko's profile. Lifeinvader is an in-game social networking website, based on Facebook. It didn't exist before the events of Grand Theft Auto V, and was founded by Jay Norris some time between 2009 and 2013. This page was last modified on 27 February 2014, at 07:28.